At NFG, we see a lot of people with problems within their existing companies- manufacturing slowdowns, logistical inefficiencies, budgeting blunders and market-entry difficulties-but the other day we had the pleasure of helping an entrepreneur form his emerging business idea into a solid foundation on which he can grow his company into the future. It's much easier to do things right from the start than to fix them later. By following a few important steps, we were able to lay the proper groundwork and enable our entrepreneur to concentrate on the bigger challenges of running and growing a new business. The best business ideas come from asking ourselves a few simple questions. Intellectual curiosity and accidental discovery have led to some of the greatest inventions of our time, with someone simply asking himself, "Isn't this interesting?" For example, the Post-It Note came about when creator Spencer Silver was trying to make glue but instead created a substance that only barely held paper together. The question, "Therefore, what?" arises whenever a new trend is spotted or predicted, and the assumed consequences are turned into a business idea. Take for example Instagram, which arose by seeing the trend of smartphones with cameras. By recognising the relationship between photos, the Internet, and our inclination to share, rate and participate, one of the greatest social media innovations was born. Frustration with the limitations of what's currently available often leads someone to ask, "Is there a better way?" Ferdinand Porsche once said, "In the beginning, I looked around and, not finding the automobile of my dreams, decided to build it myself." Steve Wozniak built the Apple I on his belief that computers shouldn't be the sole domain of the government, a university or a large company. Larry Page and Sergey Brin thought measuring inbound links was a better way to prioritize search results, and thereby began Google. New innovations don't always seem to have a place in the market, until a savvy entrepreneur asks, "If it's possible, why don't we do it?" The technology for portable phones was first created in the 1970s, but at the time people considered phones to be connected to a place, not to a person. Motorola changed that notion when it created both the mobile phone and the market in which to sell it. Taking advantage of weaknesses in the market leader also provide a path for new business ideas. When a leader is committed to a certain way of doing business, they are vulnerable to a competitor introducing a disruptive method. For example, the market leader IBM limited their distribution to authorised resellers. This allowed newly- emerging competitor Dell to enter the market by directly selling its computers. Capitalising on customer dissatisfaction creates new competitors. Take for example the frustration Blockbuster renters had with returning tapes on time and at the store-this annoyance lead to the creation of Netflix's original parcel-based business model (though their current iteration may have originated from asking, "Therefore, what?"). Stagnation also creates room for new businesses. When the market leader is busy milking a cash cow, emerging competitors can steal his chickens-this is what made Microsoft Office susceptible to Google Docs. 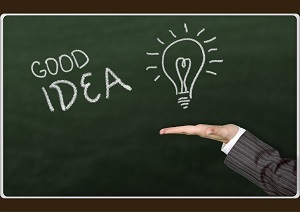 New business ideas materialise from the confluence of expertise, opportunity and passion. Expertise is the sum of what you and your founders can do. Honing this fundamental knowledge and ability can create greatness. Opportunity exists in two markets-existing and potential-and as we saw above, there are a few questions you can ask yourself to discover those markets. But mostly, there's passion, without which businesses cannot flourish. An entrepreneur's passion for starting a business must be sustainable for the long run because it's a long process, and not always a fun one. Successful companies usually arise from the contributions of at least two "soul mates." If this conjures up the idea of marriage, it should. Businesses and marriages have much in common-daily operations, long-term commitments, a focus on differentiation through small details, strategic agreements. Picking a business partner should be taken as seriously as picking a life partner, if not more seriously, considering that many businesses last considerably longer than marriages. Business "soul mates" do best when they share the same vision and commitment. Seeing the same picture-the size, the evolution, the process, the priorities-keeps the partnership and the business strong. Divergent beliefs among partners can cause a fissure in-or the failure of-a company. Consider a founder who wants to sell her share of a company for a quick profit, while her partner is interested in overseeing the long-term growth. Differences among partners can be a source of strength for a company. Diverse expertise and orientation can add value to a partnership. A start-up needs one person to make the product (Steve Wozniak) and one person to sell it (Steve Jobs). 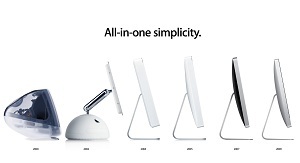 Wozniak's technological skills and Jobs' personal sales skills complemented each other's strengths and weaknesses, and the result was a formidable organization with peerless products. Some people like to focus on details, while others train their eyes on the big picture issues. An effective start-up needs both types of founders to succeed. While people may later recognise only one founder as the original innovator, it'd be foolish not to realise the team it took to make a new venture possible. Today we associate Thomas Edison with inventing the light bulb, while in fact he was surrounded by a group of fellow tinkerers-Ludwig Boehm, Charles Batchelor, and John Kruesi. Henry Ford developed the Model T, but only with the help of Wills, Galamb, Farkas, Love, Smith, Degner, and Martin. Pop quiz: what's the definition of "mantra?" No longer remember your sophomore-year marketing course? A mantra is a short, powerful and memorable statement that defines your business and its purpose. Nike's is "Authentic athletic performance." Disney has "Fun family entertainment." At Etsy, it's "Democratize commerce." This is not a mission statement, whose text may be much longer and more encompassing. The mantra at Starbucks is "Rewarding everyday moments," while their mission statement reads, "Establish Starbucks as the premier purveyor of the finest coffee in the world while maintaining our uncompromising principles while we grow." The difference lies in the brevity as well as the flexibility. The length of a mission statement lays out establishing principles and long-term goals. A mantra cuts through to the essence of your company's existence. At this stage, you'll need to describe and classify your business. To get started, answer two simple questions: who is your target market, and what is your sales mechanism? 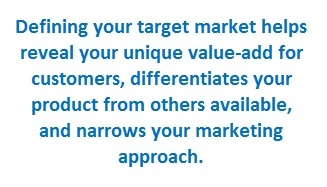 Defining your target market helps reveal your unique value-add for customers, differentiates your product from others available, and narrows your marketing approach. Defining your sales mechanism may be uncovered while researching target markets, and is where you'll find out how to insure that your revenue exceeds your costs-which, in layman's terms, means make money. Coca-Cola, one of the most recognisable brands and products in the world, follows a multicomponent business model for its famous sugar water-Coke is sold in stores, restaurants, and vending machines worldwide in varying sizes, but is always the same product. Many Internet companies have found success with the "eyeballs" business model, that is, they provide a platform from which interrelated and interdependent information is created, shared and consumed, with profits stemming from advertisements and sponsorships. A similar interdependence business model can be found with products or services that rely on other products for maximization. For example, a HP printer requires ink; Keurig coffee makers require K-cup refills; some software inspires additional purchases of upgrades, add-ons, technical support, or service. Crafting a successful business model and setting achievable goals are complementary activities for entrepreneurs. Much business success relies on the strength of the MATT you weave. This business acronym stands for Milestones, Assumptions, Tests and Tasks. Milestones are the important goals that mark significant progress along the road to success, such as initial capital, field-testable version, and cash-flow breakeven point. Assumptions include elements from your earlier marketing questions, such as market size, prospect-to-customer conversation rate, and length of sales cycle. These aspects give shape to your business model, sales mechanism, and other cost considerations. Yet while you can create a list of assumptions to formulate your business strategy, everything is theoretical until tested, either in the field or in an exploratory capacity. Defining tasks is one key to success for any business, especially in the beginning. Tasks may include recruiting employees, finding vendors, setting up accounting and payroll systems, or filing legal documents. Every early step can put you in the right direction for later success. Ultimately, when crafting the early stages of your business, you need to keep it simple to stay focused on success and streamline your activities for efficiency and clarity. You will face hundreds of decisions during the start-up process, and there's often a temptation to optimize each one of them. However, it's best to focus your energy and attention on milestone issues. Stay flexible and stick to your MATT in order to keep things clean and simple.